Reiki for Animals helps to heal, it is an intelligent healing energy which can restore balance on many different levels including: physically, mentally and emotionally. Energy flows around the body, and as with everything that flows, it can become blocked, disturbed or unbalanced. If an animal is suffering from blocked energy for whatever reason, they are unable to tell us and may present the problem to us as what appears to be bad behaviour, stress, loss of appetite, physical ailments etc..
Reiki treatments last for approximately 1 hour per treatment plus approx 30 minutes before hand for a consultation. Treatments are performed generally in your animal’s own environment through light touch and hands off healing. It is a completely non-evasive therapy. Q) What is Reiki for Animals? A) Developed aroundthe end of the 19th century by Dr Mikao Usui from Japan, Reiki ~ meaning universal energy ~ is a touch therapy. The practitioner treats parts of the body they sense are emitting weak energy by laying hands on or over the site of the problem and enabling energy to flow to that area. Dr Usui is credited with developing the system in 1922 from Buddhist and Sanskrit teachings, as a result of extensive travels, research and meditation. Reiki was originally developed for people however as an open mind is essential, Reiki is particularly effective on animals as unlike humans they have no preconceptions. Q) Does Reiki have any side effects? A) No Reiki is a completely natural healing with no side effects whatsoever. A) The body’s energy is proven scientifically and Reiki is becoming more and more popular and recognised by the health profession as an excellent complement to medical treatment. Q) Does a Reiki treatment hurt animals? A) No it is a hands-off or light touch therapy where your animal will relax and become totally at ease. Q) Can Reiki be performed on larger Animals? 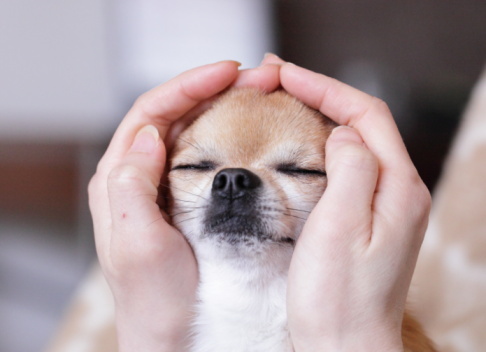 Q) How much does Animal Reiki cost? * I charge 0.30 pence per mile for every mile travelled over 20 miles.